Beginner's Forest is an Eamon adventure for beginners written by Margaret Anderson. Author Margaret Anderson created her adventures Beginner's Forest and Peg's Place probably in 1985 or early 1986, and submitted them to John Nelson in the latter half of '86. They were two of the twenty-three new adventures that he announced in the January 1987 edition of the Eamon Adventurer's Log. 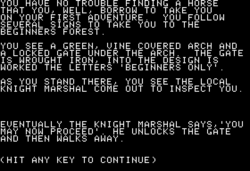 The Beginner's Forest begins similarly to Donald Brown's original Beginners Cave: you "borrow" a horse to take you to the start of the adventure where you're met by the local Knight Marshal. If he determines that you're a beginner (and sees that you carry at least one weapon) he'll unlock the gate and allow you to proceed. Take the small side-path that leads north into the undergrowth, then go west into a flowery meadow where you'll encounter Sir Grummor, a knight who may be kind enough to join you. Return to the path and go north to reach a four-way intersection guarded by a leprechaun. In the pine woods you'll run into the notorious outlaw Jesse James burying some bags of stolen money. Defeat him and take his pistol (and his cash). Follow the trail west to reach a north-south path along a lake. Wade west into it the lake to collect the fish and the long blade of grass floating there. Return to the north-south path and go south to encounter a troll guarding a small bridge. Defeat him and take his club. Go south again to find a (possibly friendly) beaver working on a dam. Do not try to step out onto the beaver dam — it will collapse under your weight and the flood of water will wash you back to the forest entrance where you began (and will wash out the trail so you can't return). Go a little farther south to find some diamonds on the sandy riverbank. Retrace your steps to return to the intersection. Follow the path that winds east and north through the trees. When you reach the "tall oak tree", climb it to get a bird's eye view of your surroundings. Climb down and continue east to reach a giant guarding the path. Defeat him and take his club. Go north and find that the trail ends in a secret garden where a Fairy Queen lives. She'll be delighted that you've slain the giant and will reward you by magically transforming the blade of grass you collected into a long green sword ("Greenblade"). She will also give you a golden coronet. You'll first encounter the supposed wizard Abradun, who may or may not be friendly. You'll next reach an east-west trail running along the base of a tall cliff. In most places it's too slippery to climb, and if you attempt it you'll suffer a fatal fall. Go east to the end of the trail where you'll find some handholds you can climb — this is the only place you can safely scale the cliff. Go up to a ledge where you'll find a scroll tucked into a crevice. Read the scroll at any time for a one-time healing effect. Climb back down, then go all the way to the west end of the trail. Go north into the small cave to find a bear. Defeat it and take the ring. At this point you've done it all, so retrace your steps back south and east toward the entrance. If you earlier fled the spooks but now have allies, you may be able to more easily dispatch them on the way out. Reviewer Tom Zuchowski gave The Beginner's Forest a rating of 5 out of 10, describing it as "well enough written, with a small, coherent map and good descriptions." Zuchowski disliked the difficulty of combat, and noted that he died five or six times in quick succession while trying to get through the map. In particular he warned players to flee the spooks who appear near the beginning of the adventure. The road back to the Main Hall is described as heading east, so the forest may lie somewhere west of Evenhold. The knight in the meadow, Sir Grummor Grummorsum, appears in A Connecticut Yankee In King Arthur's Court by Mark Twain and in The Once and Future King by T. H. White. The giant muttering "Fee Fie Foe Fum" is from the English fairy tale "Jack and the Beanstalk". The loading program references the Secret Watch of Wrenhold by Bob Davis, suggesting the game was built based on Davis's diskette.